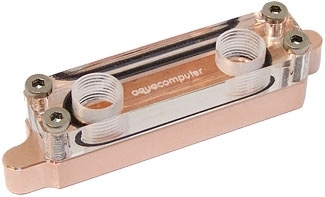 Cooler for the voltage regulators of Gigabyte mainboards of the P35 series. Especially with watercooled systems the air flow over the regulators generated by the CPU-fan is missing. This cooler allows for a highly efficient cooling of these parts and therefore prolongs the lifespan of the voltage regulators. and more. Not suitable for GA-P35-DS3, GA-P35-DS3R, GA-P35-DS3L, GA-P35-S3, GA-P35C-DS3R, GA-P35T-DS3P! One cooler made of copper incl. installation material.